This year, the Great Debate discussed the sensitive issue of the #metoo movement, bringing together teams from across the globe and sending Rollins’ team home with a win. 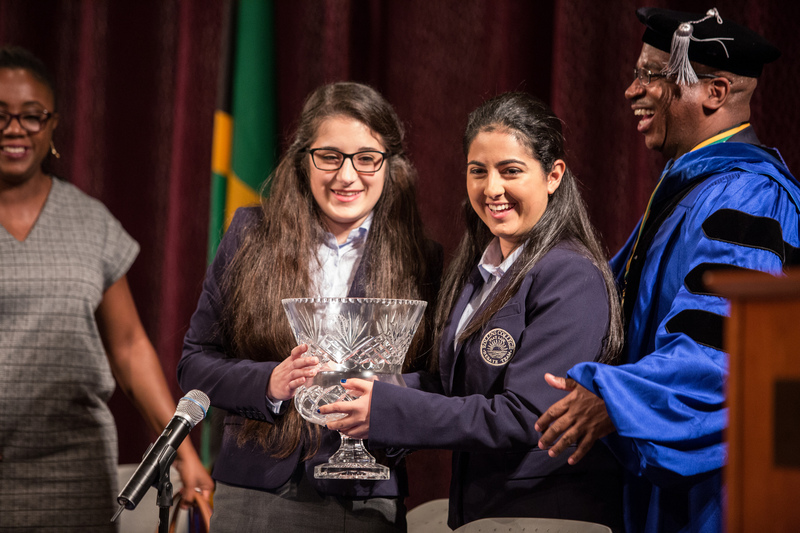 While the Rollins team, represented by Sunny Toreihi ‘20 and Whitney Elliott ‘21, were declared the victors of the debate, this event was clearly much more than a win for Rollins. Rather, as said by the coaches in the closing ceremony, it was a successful representation of the high standards Rollins sets out to achieve, and a great example of the cross-cultural barriers that our institution hopes to surpass through its emphasis on global citizenship. The debate showed Rollins varsity debate team members taking on international students from the Jamaican Association for Debating and Empowerment (JADE) and China Foreign Affairs University debate team. This event highlighted Rollins’ commitment to global citizenship and transformative learning. Both international delegations expressed their extreme gratitude to the Rollins’ team for hosting them. As part of the closing ceremonies, Dr. Barrett also presented the Rollins varsity debate team and Dr. Smaw, the director and coach for the team, with the JADE Medal of Friendship. Regarding how the #metoo movement was decided as the theme of the event, Brandon McChinol ’18 said, “This is a pertinent topic directly affecting Americans today, and because women are more than 50 percent of the population, it’s very important.” This relates to the even higher percentage of women on Rollins’ campus. The annual Rollins tradition of the Great Debate was continued on Wednesday, March 21. The event was attended by the Rollins community and students from various local high schools, such as Apopka High School and Timber Creek High School.